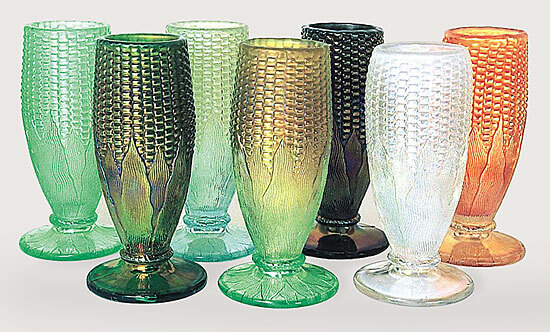 Among the most desirable of Carnival Glass shapes, the Corn vase is known in a wide variety of colors and two different styles, standard and the rare pulled husk (center). There are two versions of the standard, one with leaves or stalks on the underside of the base and the other with a plain base. The above Corn vases are (from the left), ice green, green (in front), pastel aqua, ice green with marigold iridescence, purple, white, and marigold. Interestingly, while marigold is the most common color in most patterns, it's rather scarce in Corn vases.